One of the smaller barns at our Newtown, Connecticut home. Having moved from California back to my hometown of Newtown, CT, a few months ago, I find myself writing a few more updates to friends than usual in the form of personal emails or Facebook posts. My California friends want to know what I’m doing and it’s hard to connect regularly by phone when there is a three hour time difference. When a friend recently asked for an update, I reported that my father and I were painting barns that week. 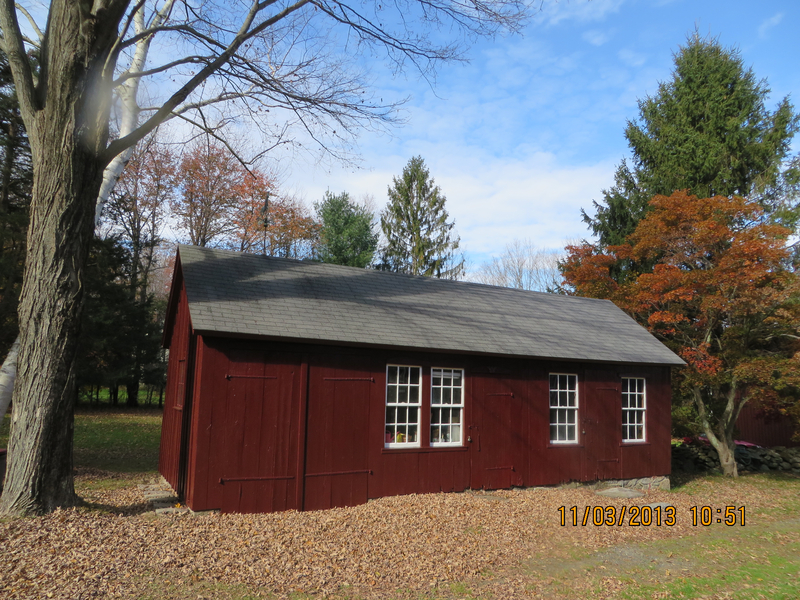 In my reply, I reflected on the childhood chore of “barn painting.” There are four barns on my father’s property, all leftover from the colonial era as the house dates back to the 18th century. My dad restored all of them; like the house, they all need to be painted every few years. I did a lot of painting in my youth. I can now report with confidence that painting as a 40-something is not at all like painting in my teenage years. Let’s just say that I was lying in bed after a long first day wishing that the ibuprofen would kick in. Anyway, I fired off my response to my friend and he replied unexpectedly, “and send me a picture of the barn when you get a chance. ” Did he really mean it? I wasn’t sure whether he was really interested in the barn, or just being cute. Regardless, the comment made me think that a picture would never show my sore muscles, the repeated action of climbing up and down the ladder to move it, the bugs and cobwebs that made their way into the paint can, the putty scraper that I carried in my back pocket to scrape away old paint, my shirt and pants that had more than a few splats of paint on them, or the smell of turpentine in the oil-based paint. Nope, a picture would never do, only a story would suffice. I didn’t write a story back to my friend in email, but I’m happy to report that painting barns does indeed make an entrance into my soon-to-be-published book, Hatched in Newtown. A few days later, my teacher at a memoir writing class taught a short lesson on “webs” for writing. She had the class members take out a piece of paper and write “chores in my childhood” in the center of the page. We then wrote all the individual chores we had as links around the central idea, like spokes around the hub of a wheel. The teacher then went around the room and asked for some examples that we had written. It was clear immediately that we all had different upbringings and that the chores were a good way to differentiate our young lives. As my chores related to growing up in an old farmhouse where we had a number of animals and raised our own vegetables and fruit, my youth reflected a more rural existence than most of the others in the class. My “web” is shown below. 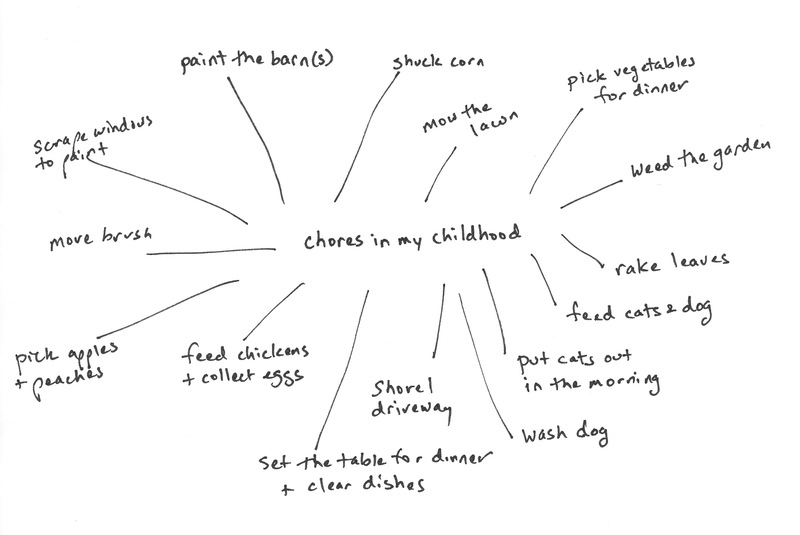 My web for “chores in my childhood.” Created Oct, 2013. I don’t know whether the creation of a “web” is a formal writing method for generating ideas, although I can report that it definitely led to a lot of interesting discussion. The class thought of other webs to write, including: jobs I have held, important people in my life, and auto mishaps. Yes, I could surely find inspiration to write after doing a short web exercise. Perhaps you can, too. Do you find a connection between your “childhood chores web” and your “grown up jobs / skills web” ? Great question! My adult skill of “gets sh– done” seems to account for most of my professional persona.